You will find that there are going to be a range of casino card games and casino table games on offer at casino sites that have Microgaming’s range of games on offer that are listed as Gold Series games, and you may be wondering just what is different about those games when compared to games of the same name but which do not make up the Gold Series collection of games. Well, Microgaming has been around since 199 and their original collection of casino games and table games whilst fun to play did begin to look a little old fashioned and as computers have become more and more advanced Microgaming decided the time was right to give some of their games a makeover. With that in mind you will find all of their Gold Series casino cards and table games now come with highly advanced graphics and high definition animations and you will find they offer a sleek look and are very easy games to control and navigate around. One such game which we think you will enjoy playing is the Baccarat Gold game and below we have put together an overview of how you can play this game online. The first thing you do need to know about playing any Baccarat casino card game is how it has been designed and how to play it. 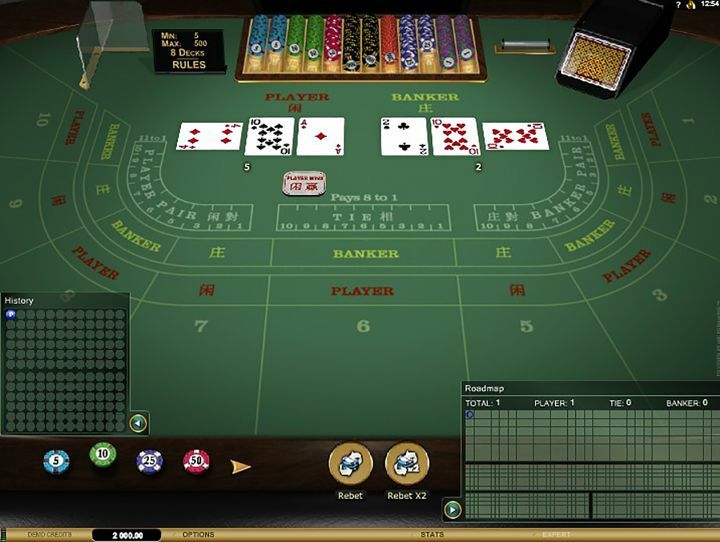 The basic aim of the game is for you to pick one of two hands that you think is going to have a series and number of playing cards dealt out to it that results in that hand having a higher value than the other hand but without going over a score of nine based on the cards in that hand. The two betting options available to you on Baccarat Gold are the Bankers Hand and also the Players Hand, keep in mind here is a third betting option which is a Tied Hand bet, however whilst the payout odds on that hand are much higher than the two other betting opportunities the house edge on the Tied Hand is huge and as such that bet offers players no real value! The payout odds of both the Players Hand and the Bankers Hand are the same being even money, however one thing to keep in mind is that when you place a bet on the Bankers Hand and that hand is the winning hand you have to play a 5% house commission, which you will not have to pay if you bet on the Players Hand and that hand wins. One thing worth knowing is that if you play at some online casino site they may not let you play Baccarat Gold or any other version on the game with bonus credits claimed via their promotional offers. Those casino sites that do let you playing this game and its different variants with bonus credits may attach some very high play through requirements on your bonus credits so it may be best to play this game for real money only with no bonus funds in your account!